I love steampunk. I read and post about new YA (and adult!) releases in the genre as much as I can. Those books may be of varying quality, but from the fully-realized scientific alternate world of Scott Westerfeld's Leviathan to the rip-roaring action of Kady Cross' The Girl with the Steel Corset to the smoldering romance of Meljean Brook's The Iron Seas series, they all capture my fancy. Every now and then I'll hear of an upcoming book that sounds, well, fantastic. This is one of those. 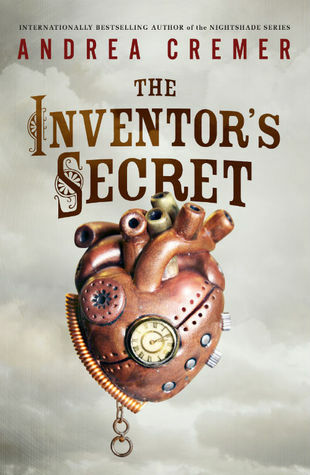 Andrea Cremer's The Inventor's Secret will be released on April 22, 2014 by Philomel (Penguin Random House). Next spring can't get here fast enough to suit me! Sixteen-year-old Charlotte and her fellow refugees have scraped out an existence on the edge of Britain’s industrial empire. Though they live by the skin of their teeth they have their health (at least when they can find enough food and avoid the Imperial Labor Gatherers) and each other. When a new exile with no memory of his escape from the coastal cities or even his own name seeks shelter in their camp he brings new dangers with him and secrets about the terrible future that awaits all those who have struggled to live free of the bonds of the empire’s Machineworks. Ugh, I need to read those Meljean Brooks. I own them, but haven't read them yet. This sounds so interesting and I love that cover. I'll definitely be on the look-out for this one. Great pick! Yay Andrea! I'm a few books behind her. I want to read this one.